Wood Boring Beetle Larvae in a Log Cabin, or One Man's Decent into Madness. A few weeks ago while sitting at the table, I heard a quiet tapping or scratching sound high up on the wall behind me. I discounted it at first, thinking that perhaps it was merely the wind blowing something up against the cabin. We do have some bamboo wind chimes hanging from the porch in that corner of the cabin, so it was certainly plausible. Of course, after a day or two when the sound resumed, always in the same spot, I took more note of it with less disinterest. Eventually it became clear to me that it was a scratching/gnawing sound, and not merely the wind. Donna agreed. I assumed a mouse had somehow gotten in behind the paneling that Papa and I had installed only a month ago. I baited a trap with peanut butter and placed it in the attic directly above the spot where we had heard the gnawing. There was NO WAY a mouse could ignore that delicious treat! So, after a few more days of increasing agitation at the sounds, and no tampering with my mousetrap, I began to think more along the lines of an insect infestation. This wasn't a happy thought. Finally, one evening with the gnawing becoming so loud it could be heard throughout the cabin, clad in my long johns, I climbed out the second floor window onto the porch roof and trod over to the spot where I could hear things. I couldn't hear anything from outside, and there was no sign at all of insect or animal entry. Back inside I moved the futon and set up our ladder so I could gain pinpoint accuracy as to the location of things. I narrowed it down to a spot between two boards. I banged hard on the wall, and the sounds stopped for just a few moments, then resumed with greater ferocity. Internally howling with anger, I came down the ladder and told Donna that if she didn't buy insecticide the next day, I certainly would drive to town to do so on my own, and that I half intended to go into town that very moment (9pm ish) to purchase it myself. Right above that knot was the spot where these emanations were coming from. As a very unwanted side effect of this, I found myself being short with Kenny in my answers and demeanour. I didn't like this AT ALL. The next night when Donna returned with some Pyrethrin, I carefully drilled a hole between two panels, so as to be virtually unnoticed. Then I inserted a straw and blasted a good dose of the stuff between the panels. The chewing ceased, and I became more positive. Of course, the next morning, the sounds were back. I blasted another good dose, and waited. That evening, the sounds were back. I was getting frantic. I blasted again, and waited until morning. No sounds! Yeah! Donna and Kenny headed off to attend a homeschooling event, and I sat at the table for my breakfast. I was rather crestfallen to suddenly hear the gnawing resume behind me again. The world around me got wavy and took on a reddish hue. A test run with scrap boards to see if it was possible to remove one "in situ". Carefully marking my area of operation. I returned with my circular saw, and carefully cut a vertical line from one edge of the panel to the other, being careful not to nick the panels above and below. Then I cut a horizontal line along the panel, and finished up with a Japanese draw saw. The panel fell out from the wall and revealed... No sign of insect damage within the wall itself. Odd. No signs of anything in here! I examined the panel itself more carefully, and noted that it had considerable wain to it (bark left on a finished piece of wood). After really scrutinizing the piece, I saw there were some entry holes on it and sawdust accumulated within them. Grandpa arrived about then, and I showed him my discoveries. 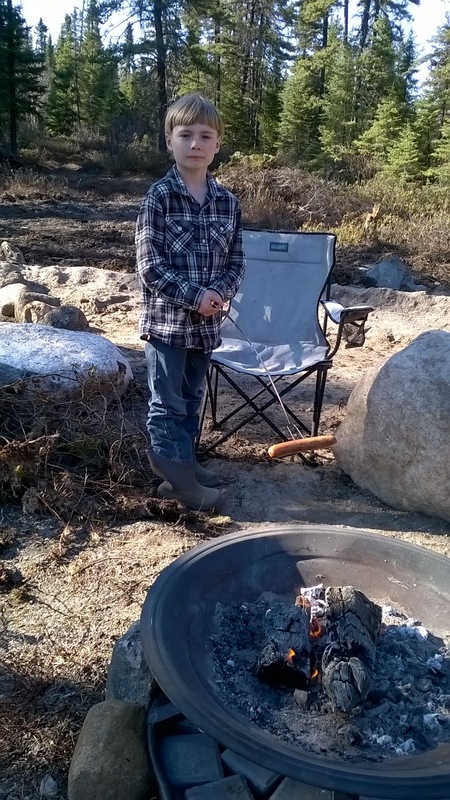 He suggested submerging the boards in water to see if it would drive out the culprits. I loved that idea and did it right away. I can see some entry holes and sawdust... No sign of the pests yet. Sure enough, white larvae appeared within the hour. I let them soak a further hour, and I'm not ashamed to say I took a morbid glee in drowning them. The sounds had ceased. There we are! Ugly critters, aren't they? I shook out the larvae on my outdoor work table, and decided to leave them for the birds. I was amazed to come back a few hours later and see them wriggling around. Tough little buggers! How can you still be alive?! I decided not to close up the wall right away, but instead blasted more of the insecticide in the cavity to deal with any potential problems. I used the dose recommended for an entire room inside each cavity. The next day, more gnawing. More gnawing = more board surgery :(. Now I'm across two studs and into three cavities! I marked the board further along the wall and removed yet another section. Sure enough, there was more bark on the back of this board. I decided to not replace the board just yet. Instead, more insecticide. This stuff is making me feel woozy, why isn't it killing my bugs?! The last piece of that board - surely they can't be hiding here too? I only had a short length of board left that ran into the corner of the cabin. This piece amazingly wasn't nailed in in the corner (probably no strap there to hit), so I was able to slide it back and forth. I slide it to the middle of my gap, and was able to actually pry it out without having to cut the tongue off. That was cool. Of course, there was a tiny bit of bark on there. But hardly enough to hide a larva! I took it outside and using a slot screwdriver, managed to pry off the bark, and sure enough, two more of the white monsters fell out onto the table. Ha! There was one of you in there! In for a penny, in for a pound... May as well scrape all the bark off! They were quickly flicked onto the lawn, and I again sprayed down the whole cavity with insecticide. I question if that stuff works on bugs in their larval stages, but who am I to know for certain? The next day, no more gnawing! For over twenty four hours I kept the gap open and listened. I thought maybe I heard some more sounds from elsewhere in cabin, but by then my insanity had broken. These little buggers were probably only interested in the layer of wood just beneath the bark, and when they ran out of that, I didn't think they would do any more damage. Time to make it look nice again. I replaced the short board that I could just wedge into the gap, then cut a new board to replace the ones I had sliced in half. The new board I did remove the tongue on, and tacked it with a single nail to a strap. It is barely noticeable, and I'm not losing sleep over it. The biggest takeaway from this lesson is that perhaps it doesn't pay to reduce your standards while choosing lumber. Seeing bark on the non exposed side of the panels didn't cause my any alarm while installing it. I didn't see how it could matter. Now I do. I suppose that one should rely on the fact that it was kiln dried to have taken care of these things, but maybe it doesn't kill the eggs? Or I just got a particular tough batch? Anyway, it's hopefully dealt with, and I can resume obsessing over other things. Barely anything to show how much turmoil this board caused. When first thinking out and installing the well, I had really only considered the twin evils of particulates (ie: grit and gravel), and bacterial contamination. As such, we had decided to continue using our Berkefeld filter system for our drinking water, but I installed a fine mesh filter to keep grit out of the storage tank if possible. After a season of use, both Donna and I had to agree that there was a noteable orange buildup in the washing machine and Berkey filter. When we filled the sink or water pitcher, the water definitely had a "hue" to it. I had hoped that this would resolve itself, thinking that perhaps it was just a function of a new well, and the colour would eventually be flushed out. Alas, I then decided to resign myself to the idea that perhaps we had a fair bit of iron in our water. Researching options, I soon realized that most solutions involve installations of large equipment that require extra power. I was and am willing to try to find more economical solutions, in triple terms of cost, space, and power requirements. Obviously our particulate filter wasn't really tackling this issue, nor should it have been expected to. Iron in water is probably a very tiny particle, or perhaps being carried within tiny bacteria that utilize this element. Checking the particulate filter revealed on a number of occasions that it also wasn't being exposed to any sand or grit anyway - it was always quite clear of obstructions, even if it too was stained orange. Probably would work fine for grit, but never really saw any! You can see the slight staining on the filter section here. I purchased a whole house water filter designed for city water hookups, and thought I would at least give it a crack at helping with our problem. Removing the teflon tape from the old threaded connectors. Kenny helped me to remove the old filter, which went slightly better than I feared - I had mounted it quite tight to the upper back corner of the kitchen cabinet, and so I didn't have much purchase on the pipe heading up to the water storage tank. Luckily I was able to pull the threaded fitting out of that pipe and replace it with a right angle fitting. You can see there wasn't much pipe to work with above this right angle connector. The incoming pipe I bent in an arc over to the input side of the filter. 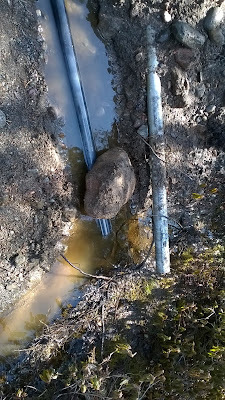 Then another right angle, threaded fitting came out of the filter and an arced pipe up to the water storage tank. Oh bother, I slightly kinked it trying to make this turn. Okay, incoming water all hooked up. And outgoing all hooked up. This filter is much nicer in the sense that it is far more accessible to me for filter changes and checking. It also came with a wrench designed just for removal and installation of filters. The original filter had a small, smooth surface, far up in the back of the cabinet. I couldn't see myself enjoying checking and cleaning it on any sort of regular basis. I installed a cheaper, paper only filter and hit the pump switch. As I referred to in an earlier post, the tail end of winter had me wondering about how well our greywater system was performing. The washing machine was causing tremendous gurgling in the sinks when it was draining, and our "rinsing" sink was beginning to drain out extremely slowly. My inclusion of "cheater" or air admittance valves hadn't seemed to have had the desired effect. Finally, as a precipitating circumstance, after doing laundry one morning a week or two ago, I noted that a puddle had appeared above the pit, in spite of it not having rained for some time. The next time I saw Grandpa, I mentioned to him that an upcoming project for me was to dig out the greywater pit and try to see if there was an obvious reason for the water level being so high in that spot. He offered to begin digging at once, and I gave him more than my blessings. At that moment I was pre-occupied with creating a new extension on our driveway near the entrance to allow me to push a little more snow out of the way at that end of things. Hmmm, mysterious soapy water this high in the water table? He dug a trench just outside the wooden cover he had made, to probe the outline of the pit. 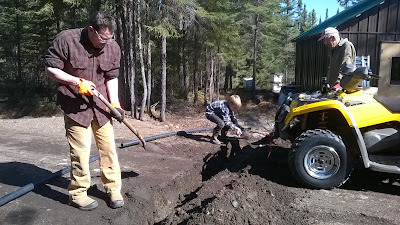 At this point I was able to help out, and we extended our digging around the cover of the pit he had made, and I trenched up to the cabin to expose the drain line(s). It was very educational - almost archaeological! At first I exposed two poly pipes, which we determined were the very original drain lines from both the kitchen and the bathroom. They had been abandoned but unexcavated during the first winter in the cabin when they froze up very quickly. Next I exposed a length of downspout and rubber sheet that we had rigged up as our secondary drain. For whatever reason, our drain water appeared to be backing up in it and flowing around the rubber sheet (which was hardly water tight). This caused the drain water to flow down the slope from the cabin until it pooled on top of the wooden cover over the greywater pit. This would not do. 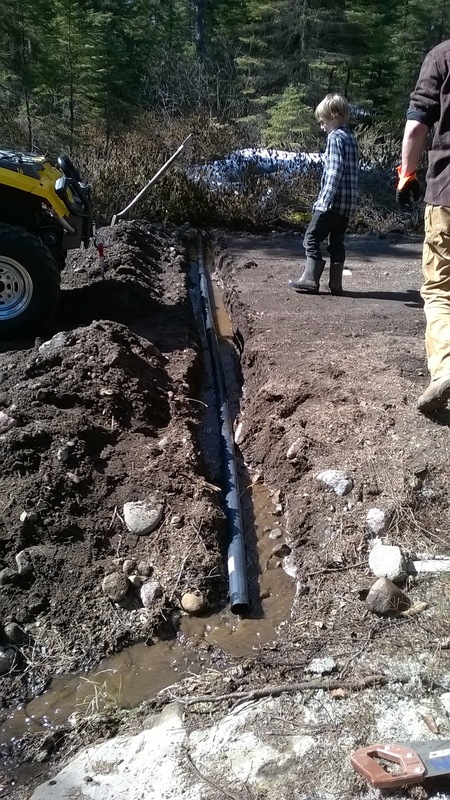 We removed the old drains, and I cut the 1 1/2" ABS pipe drain from the cabin back about a foot and a half. Then I glued on a new length of 2" ABS that extended from the cabin drain under the boards of the greywater pit. 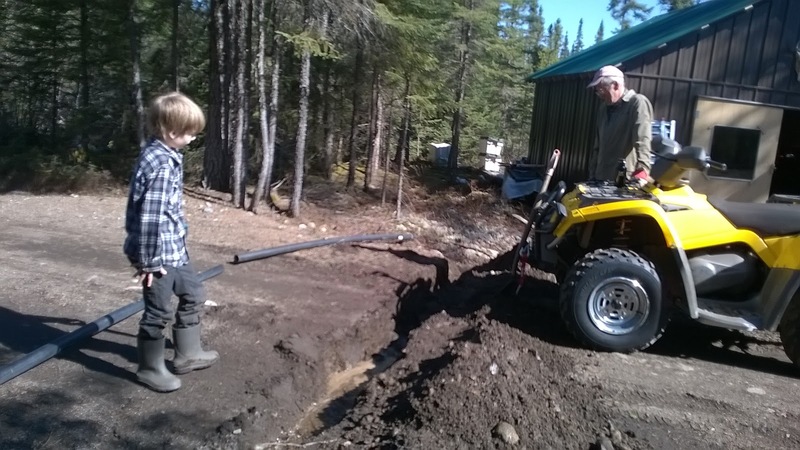 While I did this, Grandpa dug a short trench out from the far side of the greywater pit, and lay a short length of drain tile in the new trench to act as an overflow from the greywater pit. Kenny had drilled many holes through this drain tile to make it perforated and it could drain overflow into the entire length of the new trench. Water has finally drained away, but it took a day! All the rocks in the pit have turned literally grey! Why didn't Daddy just buy perforated pipe in the first place?! As an emergency option, I also drilled holes along the top of my 2" ABS pipe and lay a smaller pipe that I had split lengthwise overtop of these holes to keep soil out. Ahhh, not sure if this is my best side. Grandpa decides to use the comealong to remove a large boulder from his trench. I'm quite happy to watch. A high level discussion of what to do next. Kenny's already moved on to putting in a border around our Zen garden. We then backfilled our excavations with pure sand - hopefully that will also be more porous than the claylike soil we normally encounter throughout our property. Of course, the water and ground are thawed now. I will continue to build up the sand pile over the greywater pit in an effort to keep it insulated for this coming winter. I would not want to have to think of any alternatives at this point. 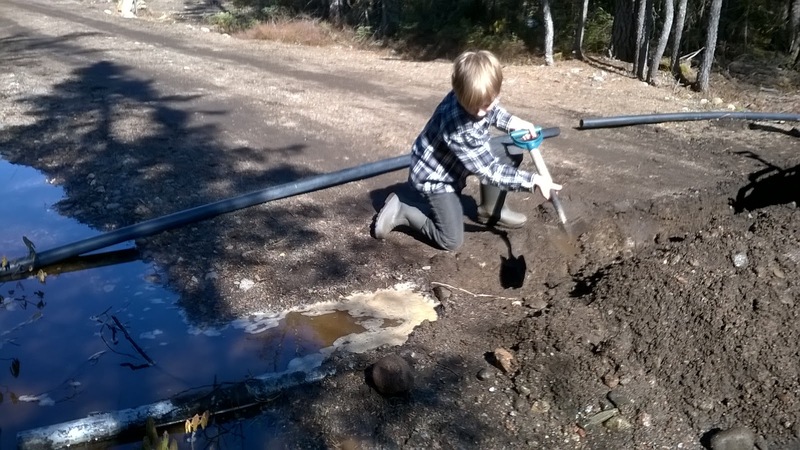 It remains a mystery why the water table seems so high, hopefully just because it is spring, and that the pit will continue to serve us well into the future. I'm sure I'll keep everyone posted. The weather has been really nice and warm and sunny lately. 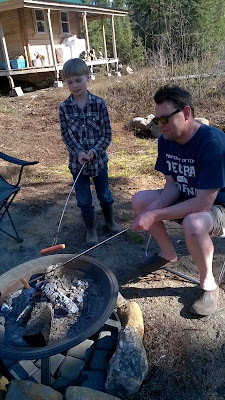 We decided to take advantage of this and start up our campfire and have a few hot dogs. I also made a nice potato salad using potatoes I had canned with our new induction stove, as well as some mayo and chives from our garden! The simple joys in life. Close to the cabin we have a large rise between our living areas and the front of the property. Skirting alongside this rise is our driveway. 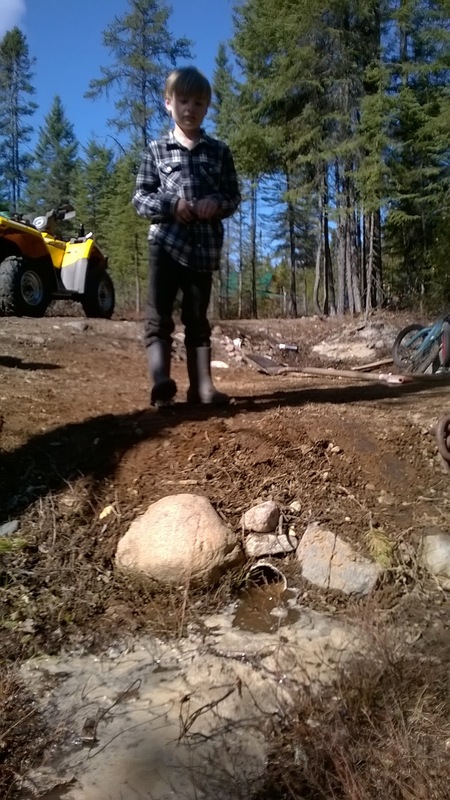 Where the driveway meets the rise, there is a very small ditch which has so far collected spring runoff and held it there for most of the summer. I suspect that this helps generate many of the mosquitoes which plague us during the hottest days of the year. Near our garage/workshop Grandpa had previously installed a makeshift culvert out of a length of pipe, a length of downspout, and a joint made from a Ziploc baggie. It was very shallow, and over the course of this past winter, it finally worked its way to the surface of the driveway where we began passing directly over it. It worked okay, but clearly could use some upgrading. I had previously brought home some 2" ABS pipe from the dump for "future projects", and the future was now... 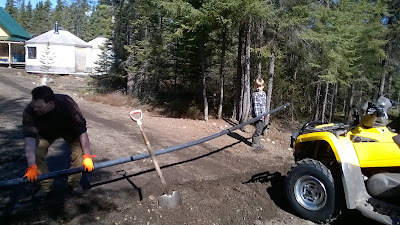 I only had to invest in a proper coupling for a few dollars and I would have a culvert of sufficient length to deal with our driveway. Kenny and Donna were both eager to join in on this project, so we all headed down to the garage to plot our concept. I definitely wanted to dig up the length of pipe that had heaved through the surface of the driveway. That went very quickly. After that though, I wanted to adjust the direction of the spout, so that it wasn't on such an angle. This would let me use a shorter length of culvert/pipe, but would also allow me to ignore the section of downspout that was buried deeper in the driveway. I decided to simply abandon this pipe rather than remove it. We started digging a nice, straight path across the driveway, beginning at the garage, or lower side of the driveway and working our way over to the opposite and higher side. Soon we had dug a trench that was clearly much lower than the original pipe, and was quite close to joining up with the standing water in the ditch beside our driveway. With great excitement we finally broke through the wall, and a large gush of water began to flow through our trench. It was surprising just how much water can be stored over such a large area, even if it isn't particularly deep. Still lots of water flowing! As the flow evened out, we glued the two lengths of pipe together and rolled it into our trench. 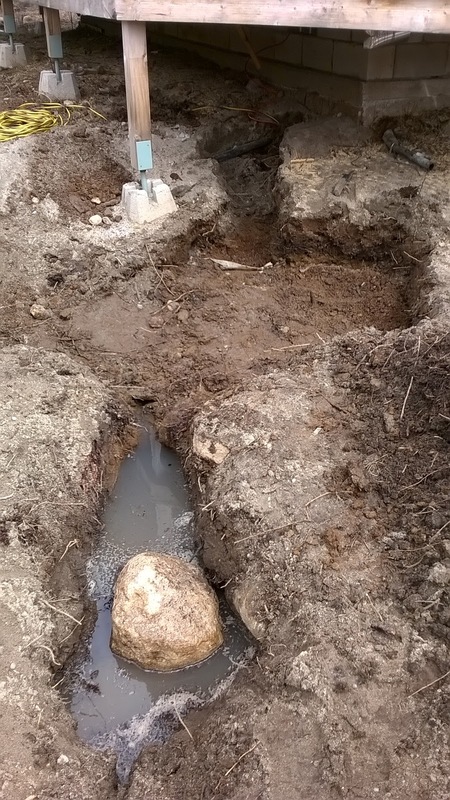 I placed our largest excavated rock on the high end of the pipe, and we began to back fill around it. Time to put in the new culvert! Water ran through it at a good clip for the next twenty four hours, before it dropped to more of a small stream and eventually a trickle. Two or three weeks later, and I brought up a small load of extra gravel from my pile to fill in the depression that seems to have developed over the new culvert. That was easily enough accomplished and a small price to pay. On the plus side, the high side of the driveway is... high and dry! Water is Flowing in the Sauna! Sorry for the delay, but about three weeks ago I turned on the pump in the sauna on a lark, and lo and behold! Water! No more carrying buckets from the cabin to the sauna! That's awesome! I am planning to reroute the plumbing in the sauna and remove the storage tanks there eventually, and simply have the water pump into the sink whenever we turn on the switch. 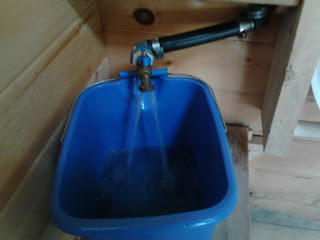 Now that we have a decent supply in the cabin, we really don't need to store much water in the sauna. With Kenny and I both deciding to take a break from Judo, I still wanted to continue our training. 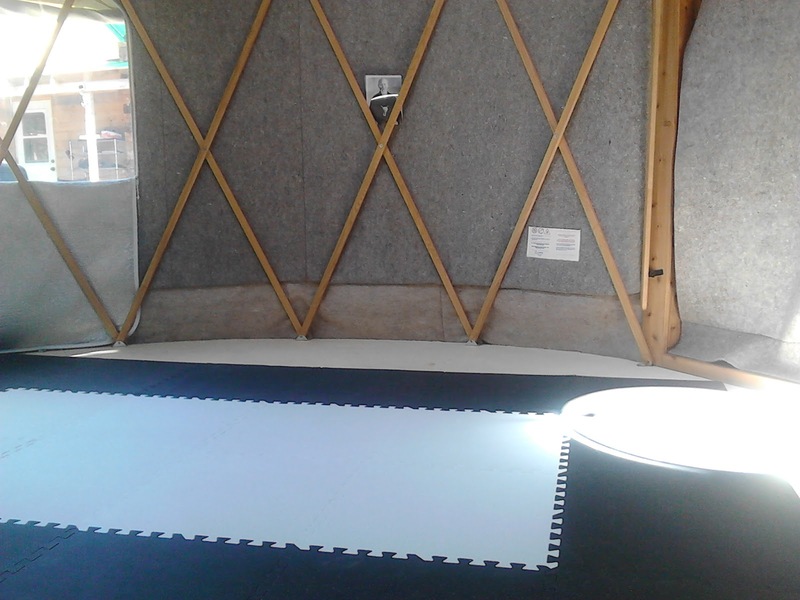 As such, we had cleaned out the larger yurt to allow for potential purchasers to view it, and I decided to use it as a good training space for us. 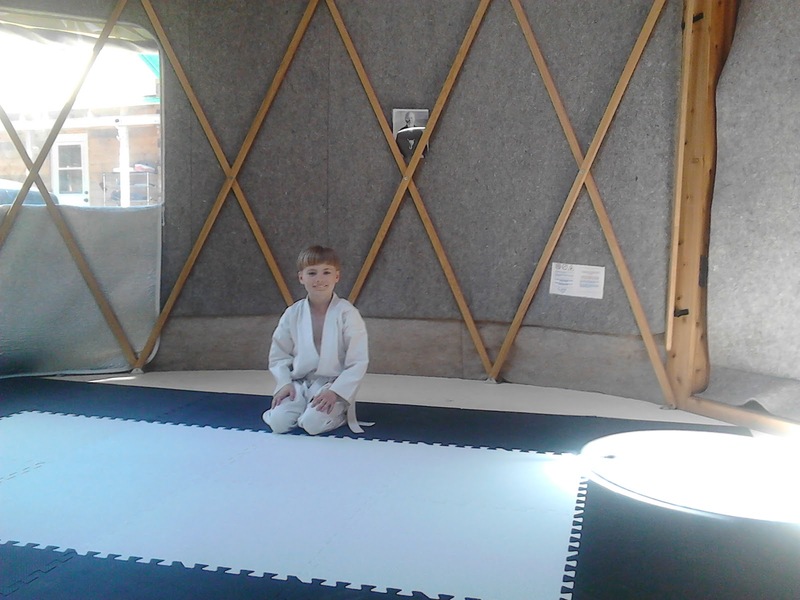 We have been trying to get out there a few times a week for both taijutsu training, as well as some buki waza (so far aiki ken practise). After a few rounds on the plywood, we decided to wimp out and add some cheap puzzle mats. I think they actually look nice here. Complete with a nice picture of O'Sensei. Now we just need a kamidana? If anyone wants to join us for training - we're game! Still smiling even after hard keiko!